A snooty dinner party at the opulent mansion of a socialite goes smashingly well. The high-society snobs in attendance will always find a reason to complain, or at least gossip viciously about each other, but the wealthy hosts orchestrate the festivities with exquisite taste and proper decorum. After the party, the guests don't observe the same flawless etiquette. Nobody leaves, even when the hosts politely turn off the lights. The men shuck their jackets, the women kick off their heels, and everyone sinks luxuriously into a collective torpor. The next morning they marvel at how nobody has left yet and yet... nobody leaves. At first, they make up excuses to remain; just one more cup of coffee before facing the day. Then the realization slowly sinks in that they can't leave. Every time a guest walks up to the threshold of the great hallway that leads to freedom, they simply cannot proceed any further, as if some thin-skinned, petulant man-child had thrown a temper tantrum and built an wall for no damn reason at all. As days stretch into weeks, the guests turn increasingly desperate, clawing their way to outright feral. When the fresh water supply runs out, they smash open a pipe in the wall; they start eating the wallpaper; they retreat into closets to take care of impolite business; and, of course, they turn on each other. One guest disposes of another's medicine simply to be cruel, and factions plot to commit murder or, far worse, turn to religion for salvation. Surely Bunuel intends to strip away the veneer of civilization to show us how quickly civilized people can descend into barbarism; but not so fast. These sophisticates behave barbarically from the get go, sniping at each other, speaking in childish codes (a couple of them are masons who know all the secret words), and indulging in casual affairs. 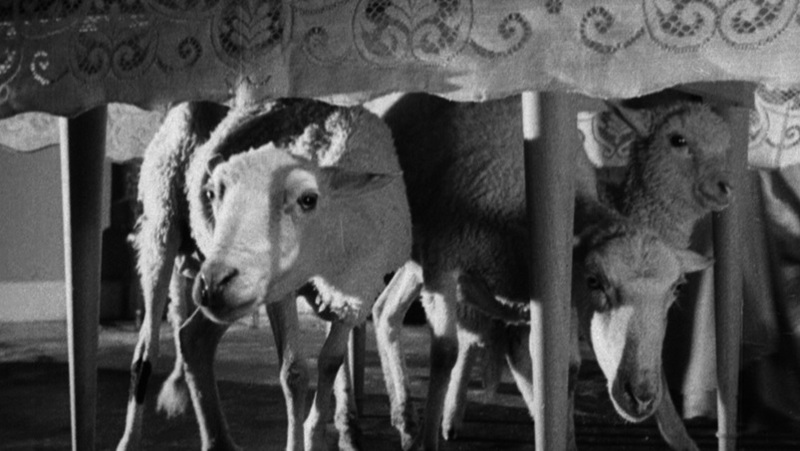 Writer/director Bunuel goes out of his way to isolate the upper-class for this existential torture. The film opens with the servants in the estate all mysteriously abandoning their posts, for reasons they can't quite articulate. They only know that they have to flee in a hurry, abandoning the ship exclusively to the well-tailored rats. This must be Bunuel's way of showing that the elites are out-of-touch with society and thus must be quarantined from it, or perhaps it's their punishment for callously exploiting the working class to fund their indulgent lifestyles; after all, one guest observes that “the lower classes are less sensitive to pain.” But no so fast. We still have to deal with the ending of the film which, well, let's just say confounds that interpretation. What about all the repetitions in the film? The guests actually arrive at the mansion twice. One of them proposes the same toast twice, meeting with a very different reaction the second time. Is “The Exterminating Angel”really the sliest science-fiction film of all-time, hinting at a time loop akin to the “Star Trek: The Next Generation” episode “Cause and Effect” in which the Enterprise crew repeats the same events hundreds of times until gradually becoming aware of their chronal trap? 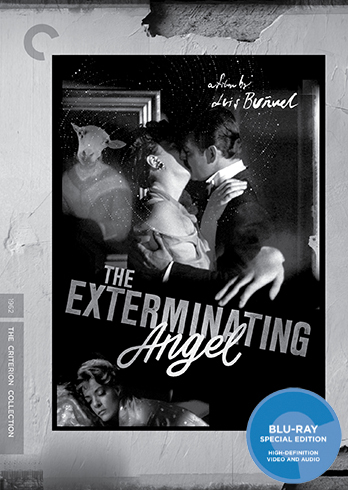 If you absolutely need to know why things happen, you might find “The Exterminating Angel” frustrating, but then you're going to wind up feeling the same way about life too. 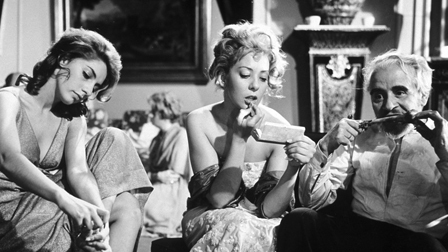 Relax and enjoy Bunuel's trademark deadpan surrealism at its most devious with this anarchistic middle finger to high society and, let's be honest, just about any kind of society at all. The film is presented in its original 1.33:1 aspect ratio. This 1080p upgrade of Criterion's previous SD release employs the same source and encounters some of the same problems, notably some visible damage in certain spots and a general slight softness of the black-and-white image through much of the film. It's an improvement over the SD and certainly more than good enough to enjoy the film, but it's a ways from the typical flawless Criterion high-def presentation, no doubt due to problems with the source material. The LPCM mono mix is one of the more troublesome from Criterion, again no doubt due to the source print. Dialogue and effects are clearly mixed throughout and there's no noticeable dropoff. However, the problem is a persistent background hiss that's pretty quiet at times, but gets rather loud and crackling in the middle. I suspect it will actually be more of a problem for Spanish speakers than for listeners who turn the volume down a bit and rely on subtitles. In any case, it's a noticeable problem, but tolerable. Optional English subtitles support the Spanish audio. The extras have been imported from the previous SD release with nothing new added. The previous release was on two discs, this is just one Blu-ray. 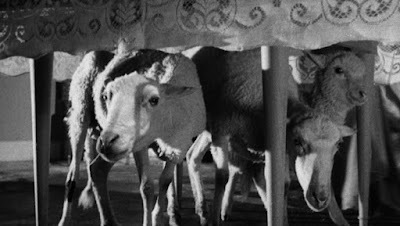 First off, this is the “correct” cut with the repeated shot of the guests arriving in the beginning, as Bunuel intended, but sometimes eliminated from certain prints by those who considered it a mistake. The major feature is the full-length documentary “The Last Script: Remembering Luis Bunuel” (2008, 96 min.). Directed by Gaizka Urresti and Javier Espada, this documentary follows frequent Bunuel screenwriter Jean-Claude Carriere and the director's son Jean-Luis Bunuel as they revisit many of the locations in which Bunuel lives or which inspired his work. In all fairness, I only watched about half of this documentary as I didn't find anything particularly insightful, but completists will surely enjoy it. The 36-page insert booklet is very attractively designed and features an essay by film scholar Marsha Kinder and excerpts from interviews with Bunuel conducted by Jose de la Colina and Tomas Perez Torrent from 1975 to 1977. I would be somewhat more flattered by the comparison today, though Bunuel might not be quite as proud.